The topping of this cake is so good, Mat and I found we’d simply decapitated and devoured most of the cake! 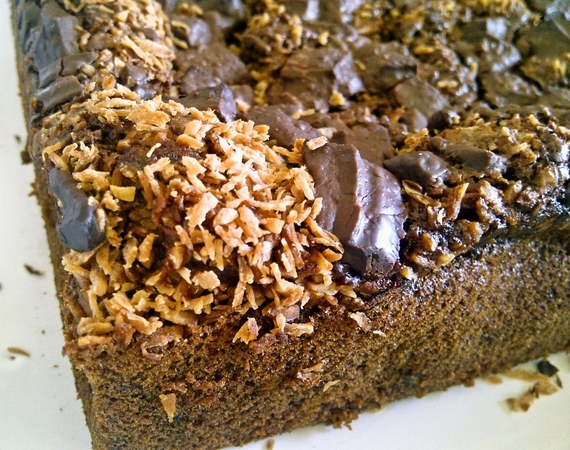 Chunks of smooth chocolate, crisp and fragrant coconut and brown sugar are a topping combination one couldn’t not love! The flavour of the cake itself was very good, but the texture was just a bit too close and dense, it will need some work I think, but for the flavour it is well worth it. I used applesauce instead of the pureed pumpkin and big chunks of good quality chocolate for the topping. Awesome. This entry was posted in Cakes, Chocolate, Egg-free, Fruit, vegan, Vegetarian and tagged baking, coconut, food. Bookmark the permalink.